The Weather Vane of the beau-monde! London Assurance. National Theatre Live. June 28 2010. Dir Nicholas Hyntner. On a balmy summer evening, sipping an idle martini, watching the sun drum down upon the river Thames. Idyllic. Golden lights twinkle in the trees, and a wave of lazy ease engulfs one and all. Except at this moment I am not actually on the south bank – not even in London. No, on this occasion I am nestled in the darkness of my local cinema with a bottle of water, a bag of jelly babies (Do they have those in America people across the pond?) and two great friends. We kick back and relax. This was my first foray into the wonderful world of National Theatre Live, where transmissions from the hallowed Olivier Theatre are beamed into bedimmed cinema screens both nationally and across the globe. My main concern would be losing the atmosphere, the sheer vibrancy and buzz of a theatre as so often happens with recorded performances – but there is the difference. As a live performance the hum of the audience was palpable, the laughter the applause. We even joined in clapping 100 miles away from the theatre. We were there in spirit. 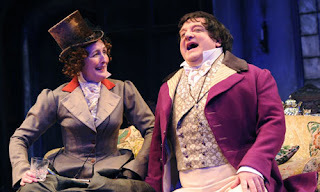 As to the play itself, London Assurance is a splendid, joyous and farcical account of an aging roué, concerned with appearances – by his own account the ‘weather vane of the beau monde’. 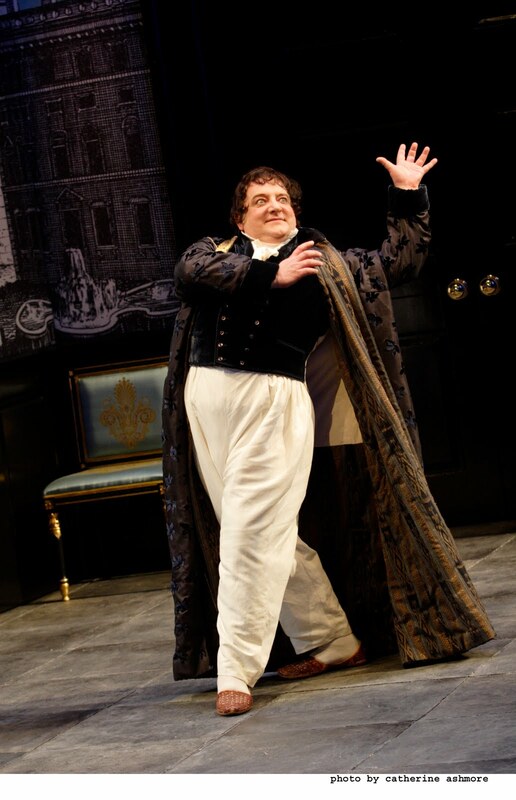 Played to perfection by Simon Russell Beale his pompous posturing and overweening egotism was delightful and uproarious. Outmanoeuvred at every turn by the horse, fox hunting obsessed Lady Gay Spanker –Yes that was the character’s name- played with obvious relish by the great Fiona Shaw. While Beale preened and smirked, she guffawed and growled around the stage. It was a delightful performance marked by warmth. Whilst we all laughed at the on stage shenanigans there was not a hint of darkness or maliciousness. The same could be said of the younger characters. Michelle Terry (Last year at the National in the rather splendid All’s Well, and the year before in an excellent Love’s Labours at the Globe) was a spirited and upbeat youthful heroine. Her counterpoint was in the daft but endearing. Paul Ready as Charles Courtly. 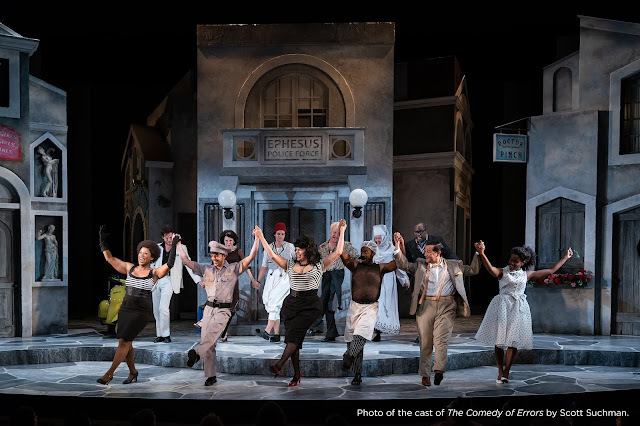 This was joyous production filled with zest and life and warmth; a pleasing punch of a production.